In this instalment, Gary Presland, sport and business journalist Gideon Haigh, musician and comedian Justin Heazlewood (The Bedroom Philosopher) and writer, feminist and ethicist Leslie Cannold will present ideas inspired by John Brack’s Collins St., 5p.m..
Gideon Haigh has been a journalist 30 years, published 30 books and edited seven others. The thinking person’s folk-ruffian, The Bedroom Philosopher (Justin Heazlewood) has the heart of a musician, the brain of a comedian and the face of a hot female character actor. 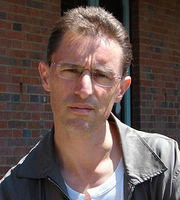 Gideon Haigh is currently considered a "single author." If one or more works are by a distinct, homonymous authors, go ahead and split the author. Gideon Haigh is composed of 2 names. You can examine and separate out names.